The Witcher Adventure Game is a different breed of Witcher adventure, but provides tabletop fun with a setting that is familiar enough to tide us over for just a little longer while we wait for The Witcher 3. What many gamers might not know is that The Witcher series of videogames is actually based on a book series that started in the mid-eighties and was written by Andrzej Sapkowski, a polish author of fantasy novels. 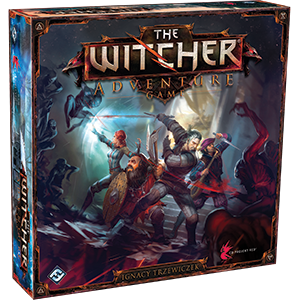 The rich world that we get to explore in the videogames is based on his work, and so is the board game adaptation released by Fantasy Flight Games in association with CD Projekt Red. As a result, the game experience isn’t just restricted to a core set of rules to follow – it is enhanced by the addition of tons of background information and lore regarding the world in which the game takes place. This leads us to an important first conclusion: if you are to enjoy The Witcher Adventure Game, enjoying such fantasy lore is almost a prerequisite. Of course, this is also true for the videogame – but to a lesser extent. Click through most of the story there and you’re still left with great combat, exploration and visuals. Skip on all the lore that the board game offers and you’re left with a fairly barebones experience and you’re not as likely to get a lot of enjoyment out of your game. Although this may not be a game for die hard board game enthusiasts in terms of rule book complexity, the many references to the Witcher universe are certain to be enjoyed by fans of either the videogames or the books. The board game’s core gameplay centers around the completion of quests – and players can determine how many games need to be completed for the game to end. This makes games of various length possible, which is good news because games have a tendency to drag a little once players get ahead of the pack and others are just going through the motions. The game is essentially a race to the “whoever completes x quests first” finish line, though that player is not guaranteed to win the game. Who wins is ultimately up to whoever gained the most victory points along the way – though in reality that is often also the player who ended the game. In true RPG style, players can select a character using four distinct choices, each with their own set of abilities and strengths. There is the all-too-familiar Geralt of Rivia, the monster slayer and player character in the videogames. Your alternatives include a sorceress, warrior dwarf and a bard – and playing with a different character will definitely affect the choices you make down the road. You can develop your character by improving your ability to cast spells, or you might opt to become better at creating potions and elixirs. Best of all – you can go down a different road during your next playthrough and create a ‘new’ experience that way. Having said that, there are some basic gameplay elements that make up the game, and as players take turns they always have to take their pick from six available actions. You can travel, fast travel (which is riskier), investigate, develop your character, unleash your special ability or rest. You can select two during each turn, but there’s always a trade-off. Resting allows you to recover, but you might fall behind in the race to complete your quest before others complete theirs. Using fast travel gets you to your destination faster, but you’re required to draw a ‘Foul Fate’ card which may spell doom in terms of victory points lost or wounds incurred. Clues are crucial to solving your quests, and can be gained by visiting cities or by investigating. Along your path you’ll also encounter monster of various strength levels that you have to overcome, and to do so you might want to develop your character a little. This, again, will be at the expense of moving towards your quest goal. The above probably makes this sound like a game of tactics and cunning, but the reality is that luck also plays a large factor – the cards you draw can determine how effective you are and how easily you can hinder other players in their quests. The outcome of a battle with monsters is even decided by how lucky you are with a couple of dice. However, master the rule book and you’ll find that there are a number of ways in which to benefit from smart decisions. The varied skill sets that come with each character, the power-up/skill tree system that you can use – a lot of elements here are true to what we’re used to from the videogames. This, along with the inclusion of a ton of Witcher lore, makes this a really fun way to fill a couple of nights with like-minded friends. The Witcher Board Game may not have the makings of a revolutionary board game – board game veterans might even call the game ‘too accessible’ – but it doesn’t cater exclusively to the board gaming crowd either. It’s far more likely to attract interest from those who primarily fell in love with the videogames and/or the novels, and if those people have an interest in board games then this is as good a starting point as any.